Join a day of fun and bring your family and friends along. The Canary Islands are famous for their crystal clear waters and this is why joining a boat trip might be one of the best experiences you’ll enjoy during your holidays. Boat trips in the Canary Islands are available from almost every island being the most famous ones in La Gomera, Tenerife, Gran Canaria and Lanzarote. There are boat trips available for any audience, interest, motivation and budget. Most of the trips available have a special theme so it’s possible for your to choose from many different specialty boat trips according to your own preferences. You might find boat trips dedicated to whale watching, dolphin watching, flying fish watching, fishing, children’s boat trips (pirate themed), speed boats and much more. Discover the wonders of the sea in one of the most amazing boat trips in the Canary Islands. 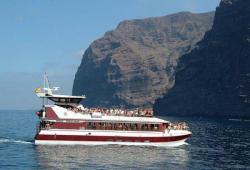 Take a tour in one of Tenerife’s touristic boats and see the island from a different perspective. Engage on an unforgettable experience by taking your family to a boat trip in Lanzarote. Find out the best excursions in La Gomera.